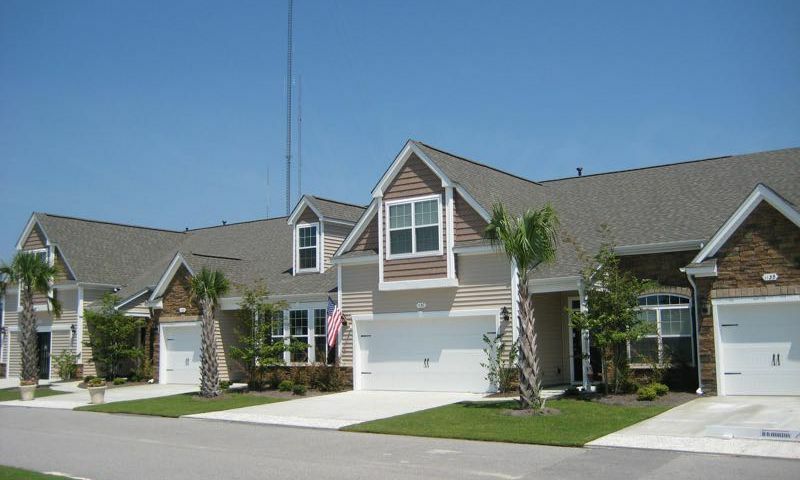 Parmelee is an active lifestyle community located in Murrells Inlet, South Carolina. Developed by D.R. Horton, this community will be comprised of 158 attached homes upon completion. This quaint community offers residents amenities to stay active and happy. Located in the Myrtle Beach area residents of Parmelee enjoy endless opportunities for recreation and entertainment in a beautiful setting. Residents of Parmelee enjoy a quaint clubhouse aimed at keeping residents active. Inside the clubhouse there is a fitness room with cardiovascular equipment. There is also a kitchenette with a microwave and refrigerator perfect for hosting parties in the clubhouse. Behind the clubhouse there is a resort-style pool and sundeck great for taking a dip or soaking up some rays. Started in 2012 by D.R. Horton, Parmelee is slated to have 158 attached homes upon completion. Homebuyers can choose between new and resale homes for sale. New homebuyers can choose between two floor plans. The Brookhaven model offers 1,802 square feet of living space with two bedrooms, three bathrooms and an attached two-car garage. While both models offer first-floor master bedrooms this model has a second-floor bonus room perfect for a den or office. The other model offered is the Wellington. This floor plan offers 1,952 square feet of living space with two bedrooms, three bathrooms, and an attached one-car garage. The Wellington model also includes a second-floor with a loft space and bathroom. This model is perfect for buyers looking for an open floor plan and an outdoor patio great for entertaining guests. Residents of Parmelee enjoy a quaint community with a low-maintenance lifestyle. An annual homeowners' association fee covers general upkeep of the community grounds and amenities as well as lawn care and trash removal for all homes. This allows residents to not be burdened by daily tasks and enjoy the community and the great surrounding area. Located in Murrells Inlet, South Carolina, Parmelee is surrounded by a myriad of options for recreation and entertainment. Myrtle Beach is less than 15 miles from the community and offers great shopping at the Myrtle Beach Mall or Barefoot Landing. Golfers will enjoy the numerous golf courses in the area with play available for all skill levels. Residents often plan day trips to one of the many local beaches less than 20 minutes away. Parmelee is a quaint community with great amenities surrounded by a scenic area perfect for those looking to live an active lifestyle. Check back soon for more information on the lifestyle in Parmelee. New homebuyers can choose between two floor plans. The Brookhaven model offers 1,802 square feet of living space with two bedrooms, three bathrooms and an attached two-car garage. While both models offer first-floor master bedrooms this model has a second-floor bonus room perfect for a den or office. The other model offered is the Wellington. This floor plan offers 1,952 square feet of living space with two bedrooms, three bathrooms, and an attached one-car garage. The Wellington model also includes a second-floor with a loft space and bathroom. This model is perfect for active adults with an open floor plan and an outdoor patio great for entertaining guests. I bought the Brookhaven floor plan last year and love living here. It's fantastic being so close to the beach and the Myrtle Beach area is my favorite place in the world! I considered buying a resale home but found that the prices here were very reasonable and I could pick the finishes I wanted. 55places.com is not affiliated with the developer(s) or homeowners association of Parmelee. The information you submit is distributed to a 55places.com Partner Agent, who is a licensed real estate agent. The information regarding Parmelee has not been verified or approved by the developer or homeowners association. Please verify all information prior to purchasing. 55places.com is not responsible for any errors regarding the information displayed on this website.